UPHI Professional Associates are Certified in Hypnosis and/or NLP with a minimum 200 hours training from a recognized organization. 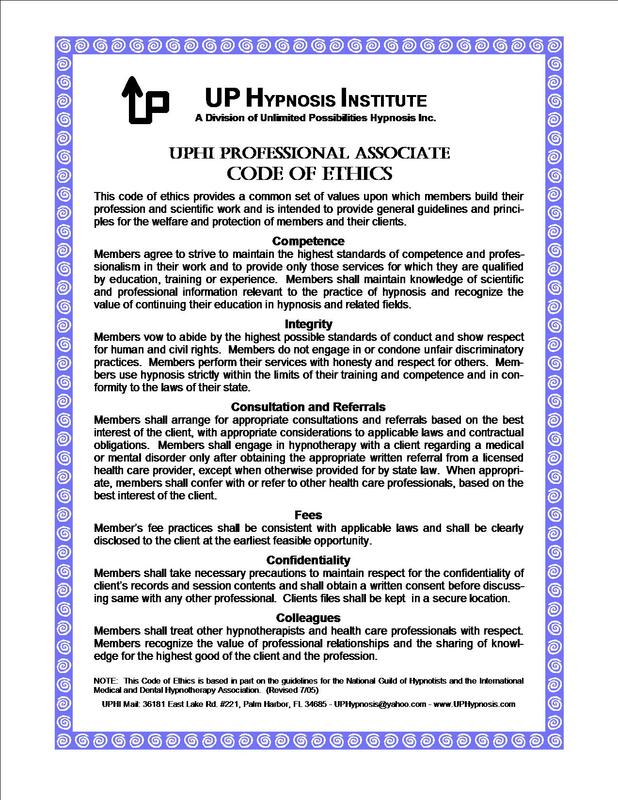 To maintain "Professional Associate" status, they must be active in professional practice, maintain a minimum 20 ceu's (continuing education hours/units) per year, and abide by the UPHI "Code of Ethics". Below is a partial list of our Professional Associates along with their contact information, training, and specialties. UPHI assumes no responsibility for the accuracy of the information provided, although we do verify training as much as possible. Any feedback regarding our Professional Associates is greatly appreciated. PLEASE NOTE: Although Patricia is now primarily a Trainer, she accepts a limited number of private clients each month, both in-person & on-line via ZOOM. Other clients are referred out to Professional Associates. Therapeutic hypnosis requires a referral from the treating physician or therapist. For Private Session & On-Line FEE structure for Patricia, click HERE! 2007 International Hypnotist of the Year, Debbie has experience with high-profile and complex cases. Debbie was certified by the Naturalife Institute in Basic Hypnosis and Integrative Hypnosis in 2002 and Medical Hypnosis in 2009 at UP Hypnosis Institute, where she is Adjunct Faculty and offers fun "Lighten UP" classes for the public. Art Emrich has been working successfully with groups and individuals as a coach, advisor, and mentor for over 50 years – helping them to achieve more than they thought possible. First in the U.S. Air Force, then with the Dupont company, and more recently with Kanbay, a Chicago-based financial services information technology consulting company (purchased by Capgemini). Art is devoted to bringing new approaches and discoveries about how to succeed to individuals, families, and businesses. Art is founder of U-Solutions, LLC, (the “U” stands for “Unconscious,” where all great solutions are located!) which he moved from Chicago to Sarasota. His athletic clients will not give him a referral! Jan is a retired college speech communications professor and has taught self-hypnosis and mental imagery techniques to individuals and groups for almost twenty years. Today, she works with clients to teach them how to overcome obstacles, find their full creative potential and achieve their dreams. Gloria Constantas has been a hypnotist for over 20 years. She loves to see her clients overcome many challenges including fears, build self-confidence, and achieve their goals. She has been on the adjunct faculty of National Guild of Hypnotists and HEA, presenting workshops like: Creative Hypnosis, Hot Flash Hypnosis, Memory Hypnosis, The Mother of Hypnosis, and Hypnotist, Hypnotize Thyself. Alfred A. “Duke” Swann IV, C.Ht.